Networking is really a skill in itself, and it is one that those wishing to enter the legal profession at any level would do well to master. It is normal to be worried about what to talk about in front of other professionals at first, but it’s easy to become a networking pro with a little bit of preparation and practice. Simply Law Jobs have set out this simple guide to help you ease into networking and fine tune these essential skills. Firstly, networking is not just about making social media connections. It can come in many different forms and can be organic, natural or formal. Basically, it’s about getting to know people, building relationships and gaining knowledge in a professional work capacity. Connecting and chatting with people over social media is fine, but nothing beats a face-to-face meeting to establish relationships and build trust for potential business or job opportunities. 2. What’s the best way to start? Events are a fantastic place to start your networking journey. Speakers and delegates regularly come together to discuss all things law and legal related. You name it, there will be an event somewhere discussing that topic. In terms of employment, most of the bigger events have a full day set aside to help people who are looking to progress further into the industry, and more often than not, it will be free for students or trainees to attend these events. Once you’re there, use the time to make useful contacts and business connections for the future – you never know where it might lead. If the event isn’t directly related to a careers theme, you can still make a big impact during your time talking to people there. Whilst chatting, perhaps you could see if they needed some free admin during the summer holidays or a guest writer for their blog? One of the major fears of networking is that you will ask something silly and then suffer the embarrassment of their answer before you scarper away. However, the key to avoiding this is actually very easy, preparation. If you do your homework beforehand, you’ll know who is there discussing which topics, and you can arm yourself with great questions beforehand. Granted, it can be daunting, but a good question will make you stand out. Knowing that you are prepared will also give you confidence and will take away the pressure of having to think on your feet. It will also allow you to get the most out of your time at the event or meeting because you will already know who you want to speak to. Preparation is important here as well. One of the worst parts about speaking to someone new is the fear of the unknown. Give yourself a fighting chance by having a pre-prepared soft opener. It doesn’t have to be work related, it could be as simple as chatting about the weather or discussing some recent news, but knowing how you are going to start a discussion stops any awkward silences or pauses until you really get into the conversation. There are no hard and fast rules when it comes to networking. So if you feel more comfortable taking a friend or work colleague, ask them to go along with you for support. It might just give you the confidence to say something you wouldn’t ordinarily have had the courage to alone. It’s completely normal as even the most confident people can find this environment quite intimidating. You also don’t need to fall into the trap of thinking that all you can talk about is work or work related topics at networking events. Sometimes a great way to make a good first impression and be remembered is to find other common ground and chat more freely. Just remember to always be professional. By attending networking events, you will often have the chance to be part of a bigger group. Join committees, volunteer on programmes and help organise events – being part of something bigger might just be the stepping stone you need for success. They will also help develop your planning, communication and teamwork skills, as well as looking great on your CV. 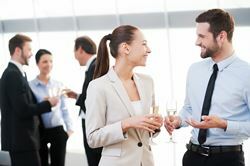 It may be entirely possible that you will meet someone whilst networking who would benefit from having you as a connection. Perhaps you would be a good mentor or know someone who may be of interest to them. Always be supportive and help others with their networking too.